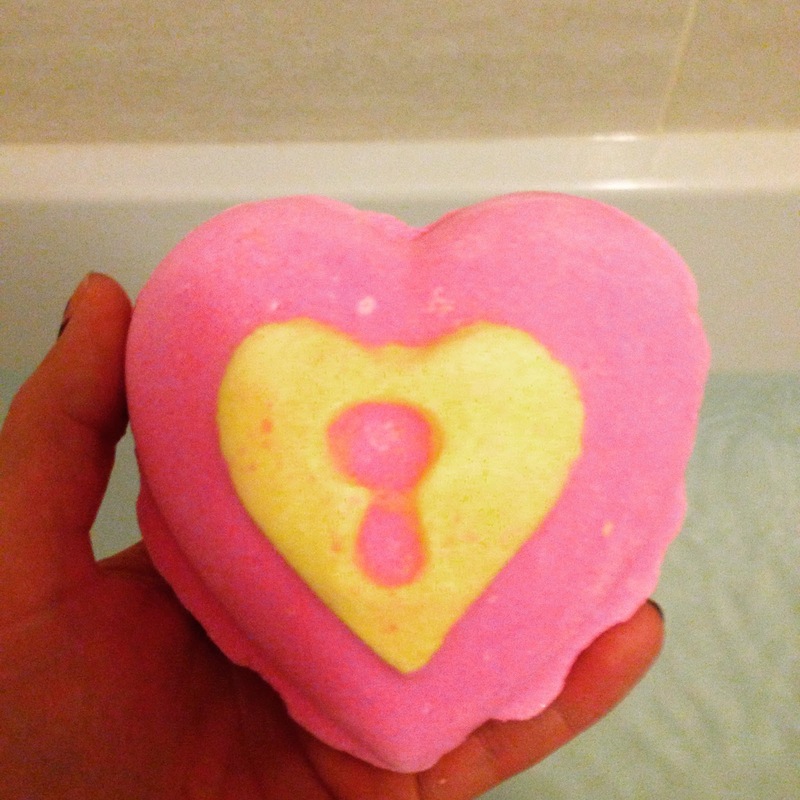 I received this bath bomb as a Valentine's Day gift, it is from Lush but as it was part of the Valentine's Day range it is now discontinued, however I thought it was too good not share with you! I was instantly surprised with how big the bomb is, it seems bigger than a lot of bath bombs. The lock design on the front hinted that there would be some surprises hiding inside. 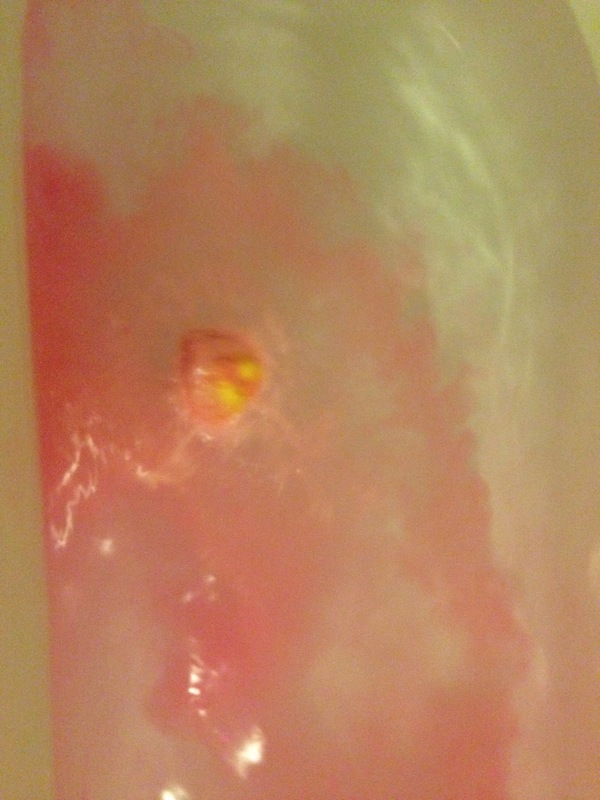 When I dropped the bomb in the bath it started fizzing and turning the water pink. The picture doesn't do the bomb much justice as I was too excited to concentrate on taking photos and I just wanted to get into the bath. Once I got into the bath I realised there were little love hearts coming from inside the bomb. I loved the surprise as I didn't expect them to come out of the bomb. It was like heart confetti in the bath which floated and sunk to the bottom of the water. The bomb didn't take too long to dissolve in the water, that is why there is only one photo of when I dropped it in the water, I felt like it was all over too quickly. I have read some other reviews which suggest cutting the bomb in half to get two uses out of the bomb, which sounds like a great idea but I want the full experience of the bomb and it would be a lot less exciting without the heart confetti surprise. The bomb left my skin feeling silky smooth and sweet smelling, this was because the product contains vanilla and jasmine, so it was a real treat for my bath time. 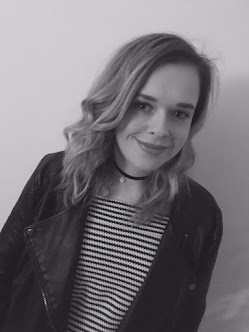 I loved this product as part of the Valentines Day range, I wish I had tried out the other products but I will have to make sure I am super eager at stocking up on the range next year.